This trek heads northwest from Paro, offering a great variety of trekking conditions, from picturesque farmland and sub-tropical forests to alpine pastureland and high passes. This trekking route has a combination of thick forests of rhododendron, willow, oak, blue pine, golden birch, juniper. It takes you through the isolated, unique and traditionally rich villages of Chebisa and Laya, passing through several nomadic campsites. Wild life such as Takin and Blue Sheep can be seen and even snow leopards can sometimes be spotted on this trek. Relax at the hot springs. It is truly a rewarding trek! Day 01 - Arrival in Paro airport (2280meters). Overnight at the hotel. Day 02 - Paro Sightseeing Tour. Overnight at the hotel. Day 03 - Drive to Drukgyel Dzong trek to Shana . Overnight at tented camp. Day 04 - Trek to Thangthangka (3250 Meters) Overnight at tented camp. Day 05 - Trek to Jangothang (4044 Meters) Overnight at tented camp. Day 06 - Jangothang Acclimatization day. Overnight at tented camp. Day 07 - Trek to Lingshi (4010 Meters) Overnight at tented camp. Day 08 - Trek to Chebisa (3990 Meters) Overnight at tented camp. Day 09 - Trek to Shakya Pasang (4000 Meters) Overnight at tented camp. Day 10 Trek to Robluthang camp (4160 Meters) Overnight at tented camp. Day 11 Trek to Limithang (4,160 Meters) Overnight at tented camp. 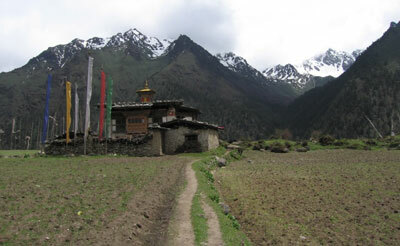 Day 12 Trek to Laya (3800 Meters) Overnight at tented camp. Day 13 Rest day in Laya (3800 Meters) Overnight at tented camp. Day 14 Trek to Koina (3,240 Meters) Overnight at tented camp. Day 15 Trek to Gasa Hot Springs (2220 Meters) Overnight at tented camp. Day 16 Trek to Damji village our transport meets us here for the drive to Punakha. Overnight at the hotel. Day 17 Drive to drive to Paro. Overnight at the hotel. Day 18 Transfer to Paro international airport for your final departure. Note: The above itinerary is a guideline and standard pattern which we provide you. This trekking can be modified according to your time and requirements.